--Player Business Cards, Letters, etc. While many high-level items owned by baseball players have graced the pages of such top auction catalogs as Mastro, Sotheby's and Christie's, personal player mementos like business cards and letters can be found for those on a tighter budget. Indeed, many one-of-a-kind finds can be made on eBay and at card and antique shows, helping to illuminate the more obscure details of baseball history. Additional player-owned photos can be found in the Photographs section of VintageBall. VintageBall welcomes interesting submissions for this section from all corners, regardless of whether or not an item originates from a Hall of Famer or a player just up for a cup of coffee. To contribute, drop us an email at [email protected]. Charles Albert Bender pitched for the Philadelphia Athletics from 1903 to 1914, jumping to Baltimore of the Federal League in 1915 and returning to Philadelphia (albeit the Phillies) in 1916 and 1917. After he retired, he scouted for major league teams (including his A's), coached in the majors and even managed in the minor leagues. 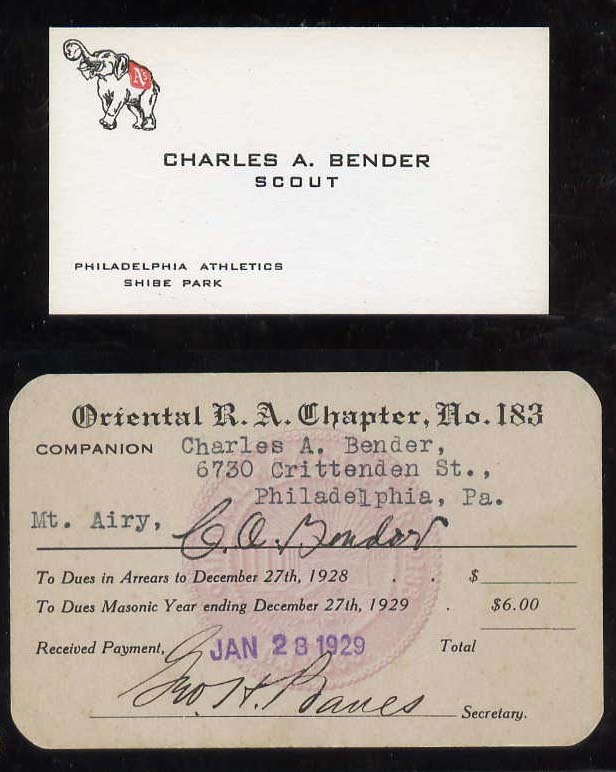 Dubbed "Chief" because he was part Chippewa, Bender always went by his given name on autographs and "official" documents, like the business card and lodge membership card featured here. The business card seen above, left, likely is from the 1930s or 1940s and was one of many sold as a lot in a Hunt Auction (this lot was broken up and the indiviual business cards were re-sold on eBay and elsewhere). Bender's scout cards appear for sale sporadically, online and off, for very reasonable prices. Marty McHale was a journeyman pitcher who played from 1910 to 1916 for the Boston Red Sox (in two stints), Jersey City (International League), New York Yankees and Cleveland Indians. Most of all, he seemed to have fun, at least according to the items featured on this page: He formed a singing quartette while with the Sox in 1910, moonlighted in vaudeville while pitching for the Yankees (either in 1913 or 1914, and later), and even jumped into the newly-born film "industry" during the teens when his baseball career drew to a close. He later went on to become a newspaper reporter and a stockbroker. He had his best baseball season in 1914, when he won 6 games and lost 16 for the lowly Yankees, who finished tied with Chicago for sixth place in the American League at 70 wins and 84 losses. Indeed, he was considered such a good prospect for the mediocre Yanks, that he pitched in the 1914 season opener -- a picture of which is showcased above. That day, the Bombers played like bombers and McHale beat the World Champion A's 8 to 2. Other NY pitchers in the opener were Ray "Slim" Caldwell, Ray Fisher and Ray Keating, as is noted on the reverse of this McHale photo (click on photo to enlarge and to see reverse). Interestingly, McHale was considered a rising star when he joined professional baseball after pitching three straight no-hitters while at the University of Maine in 1910, prior to joining the Red Sox that same year. Alas, he would make his mark not on the diamond, but on the stage where no less than Variety dubbed him the "Baseball Caruso" (with other reviewers referring to his Irish Tenor as the "Irish Thrush" and Babe Ruth, himself, canonizing McHale as the "best goddamn singer I ever heard"). 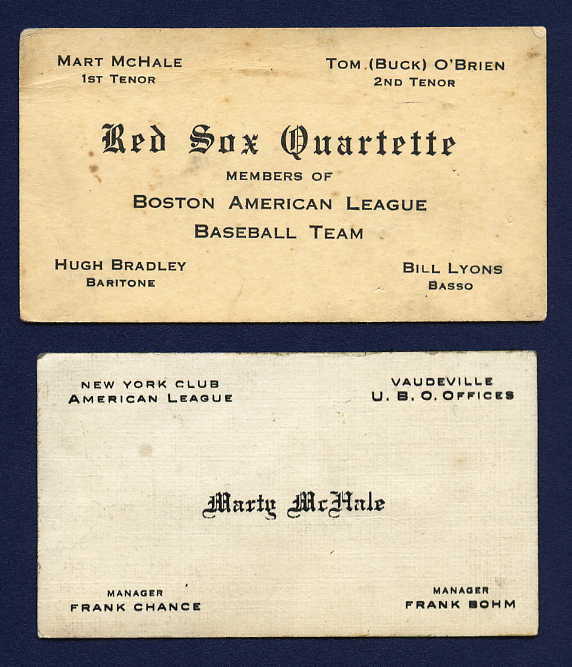 Playing for Boston in 1910, McHale was a co-founder of the Red Sox Quartett, showcasing the talents of "Mart" McHale (1st Tenor), Tom "Buck" O'Brien (2nd Tenor and fellow Sox pitcher), Hugh Bradley (Baritone and outfielder), and Sox second baseman Larry Gardner. Bill Lyons replaced Gardner in the act in 1911, becoming Basso, with the Red Sox signing him to a professional baseball contract to keep the Quartette solely comprised of Sox players! A rare business card advertising the services of this not-so-fearsome Sox foursome can be seen above. When McHale joined the rival Yankees in 1913, the group quietly disbanded. As can be seen from the other business card highlighted above, McHale remained in show business when he moved to New York and moonlighted in vaudeville. Interestingly, despite his business card mention of Yankees manager and future HOFer, Frank Chance, McHale joined forces not with a fellow Yankee but with a New York Giant. Together with famed Giants outfielder, "Turkey" Mike Donlin, Mchale established a highly successful act entitled "Right Off The Bat." After ending his undistinguished baseball career with Boston and Cleveland in 1916, McHale leapt into the film business (as did Donlin), as can clearly be seen from the letter shown below. In this letter, McHale implores Cleveland star Tris Speaker (to whom he refers as "Spoke") to join himself, Donlin and Tigers regular, Germany Schaeffer in an early movie being shot after the close of the 1917 baseball season. 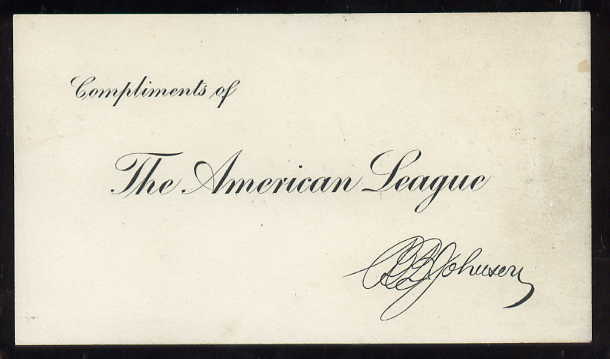 This letter was typed on the back of letterhead from the All Star Feature Corporation of New York (see both images, below). After serving as President of the Western League from 1894 to 1899, Byron Bancroft "Ban" Johnson changed the name of the league and founded the new American League. He served as President of the new league from 1901 to 1927 as it grew in prominence, eventually retiring in 1927. This card on the left accompanied a complimentary offering from the League and Johnson. Just what type of gift to which it was attached is not known, although the design likely was used on cards enclosed with a variety of offerings. With no other accompanying information, one cannot easily determine the age of this card that boldy depicts Johnson's facsimile signature. Obviously the card is pre-1927.